Cendrex Access Doors are Manufactured to Order. Expedited Shipping options occur 3-5 business days after purchase. The CTR is the newest generation of all purpose access door. Easy to install, it will blend in better than any other door on all non-rated surfaces. Its special European type hinge allows the door, with its beveled edges, to close over the flange thus avoiding additional labor to mud or plaster the flange. The CTR features a truly cohesive appearance due to its well-integrated design of concealing the space between the panel and the flange. 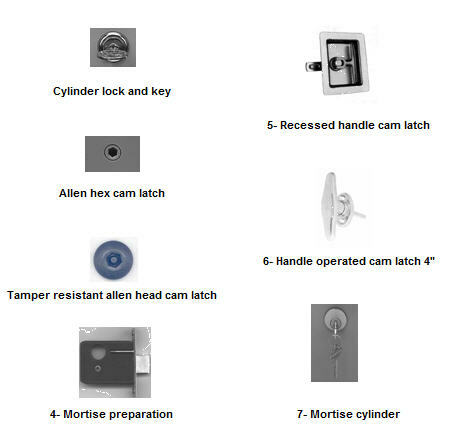 Key operated cylinder cam latch, hex head cam latch, pinned hex head cam latch, handle operated cam latch, mortise preparation for cylinder.